Remember when they said computers would help us get rid of paper? I do. I’ve been waiting for this paperless society for 30 years. Instead, it seems that computers have only made it easier to produce more paper. And while the paper clutter drives us mad, we are still reluctant to let go of much of our paper. I have been guilty of this too, to some extent. 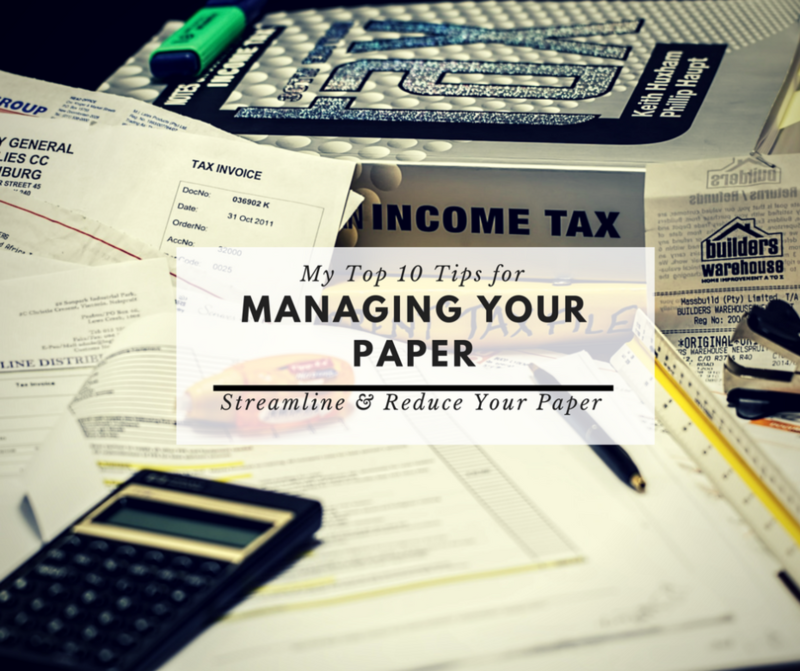 But I have made some changes in the last year and wanted to share my tips for streamlining paperwork. You may not be ready to do everything, but anything you can do will help. Automate your bill paying. I resisted this for years as I felt I needed to be in control of it. The truth is, I have rarely had to dispute the details of a bill. If you need more incentive to do this, get a credit card that gives you cash back (ONLY if you do not have credit card debt!) and use this card to pay to automatically pay your bills. Now, the only bill I pay myself is the credit card bill. Go paperless with your bills and bank statements. I know, it’s tough to let go. But the half hour I spend each month downloading the digital bills and reconciling my bank statement (yes, I still do that), is so much simpler than letting the paper pile up, eventually filing it, and then cleaning out and shredding at the end of the year. Sort your mail over the recycling bin. This idea has been around a long time. I’ve always been good at this one, but I still see many people file marketing material and envelopes. These things take up so much space and you don’t need them. While you’re at it, if you have never read one of your investment prospectuses, you can ditch those too. Even better, opt out of receiving them. Make a list of charitable organizations you want to support. Only open and respond to solicitations from those organizations. Toss the rest, unopened. You can always modify your list over time if you want, but the list will keep your decision-making process simple. Make another list of what documents you want to keep, and for how long. There are many lists available to guide you in what you need to keep forever, and what you can let go of after a certain period. Use one of those as your guide, and make your own choices. Once you have this list, you don’t have to keep re-making the decision every time you handle paper. What doesn’t go in the recycling bin should be sorted into two piles -action and reference. Have a designated home (tray, basket, wall file, whatever) for each of these piles and go through them on a regular basis. Don’t know what to do with a piece of paper? Put it in the action pile and make the decision when you go through your actions. You don’t have to file reference papers every day, but your bin for those papers should be your guide- when it’s full – it’s time to file. Purge as you file. For items you don’t need to keep forever, remove unneeded documents as you file the new ones. When you file your car insurance papers, the previous one has expired. Unless you have an outstanding claim, you don’t need to keep the previous one. Unsubscribe. If you have stacks of magazines or catalogs you never have time to look at, unsubscribe. Just about everything is available online these days. And if you’re spending a lot of time online, chances are you’re reading the material you’re truly interested in online. If you have a post office box, put a red dot inside at the front of the box. This tells the postal worker that you do not want any unsolicited mail. You will still receive anything with your explicit address, but no more flyers. Use the best filing method for you and the material you’re keeping. There are so many filing options these days – traditional files, binders, magazine files, expanding file folders, plastic sleeves and pockets, wall hanging files, portfolios. You don’t need a filing cabinet at all if you don’t really want one. And not everything has to be filed the same way. If your current system isn’t working, try something different.